Good evening, all! I just came back from picking up my CSA box at Basket of Life farm, and it looked so good that I couldn’t wait to share it. 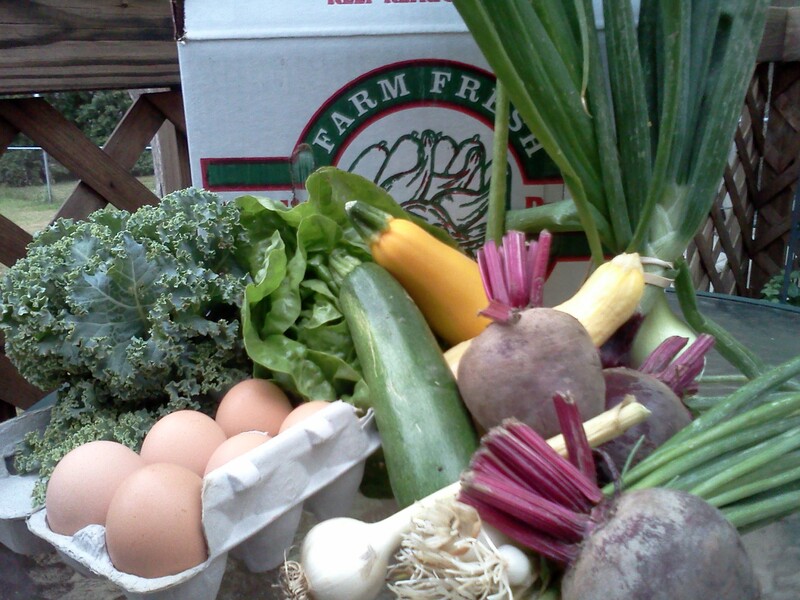 Quite a haul this week – Kale, lettuce, spring onions, green onions, GIGANTIC beets, zucchini, yellow zucchini, yellow squash, garlic and eggs! All the oniony goodness was making my car smell yummy on the way home. Last week, I cut the spring onions in half and just grilled them with some olive oil, salt and pepper – amazing! I’ll probably do the same this week. The beets are the wild card for me; I’ve never cooked them before. But I know that Brian loves roasted beets, so I’ll give it a shot. This entry was posted in General on June 29, 2012 by Melissa. Beautiful bounty! Looking forward to seeing what you make of all of it! Linked up! I love reading all the comments on your link party. There are some great ideas and recipes! Wash and cut off the ends. Wrap in foil with a little olive oil, salt and pepper. Bake for an hour to an hour and a half at 350 degrees. Those beets are big and you want them completely tender. Or I do, anyway! Peel and eat then or slice cold on a salad. Thank you for the recipe! I’ll let you know how it turns out! Your produce looks great! I love your display! Great haul! Roasted beets are great, but if it’s summer where you are, you can grate them raw and add them to a salad. They will be sweet tasting and the colour is wonderful. I have kale coming up in my CSA box this week. Not sure what I’ll do with them since I don’t think my husband will like it. Great idea with the beets! I ended up pickling them this time, but I’ll remember that if/when I get some more. I don’t have any great kale recipes on hand, but it’s good in soups if your hubby would like that. Thanks for commenting!